On a Thursday night at Echo Park's club du jour, the Echo, I came across an articulate, rapid-fire underground rapper named Busdriver. With a powerfully resonant voice and lyrics that speak to a world beyond bling, he, well, transported me. As he performed - "I looked over your rap and saw several grammatical errors on my first proof read, that's why my catalog is what your merch booth needs" - Busdriver stalks across the stage with the mic cord thrown around his neck. Something in his delivery reminded me of Public Enemy's Chuck D, but Busdriver has a fresh, direct style all his own. The air hung heavy with sweat and the smell of pot mingling with bubblegum. A quick glance at the packed crowd revealed a remarkably diverse audience: white kids with dreadlocks, black kids in baseball caps, a girl in a veil and a group of Latinos grooving to the infectious beat. As the bespectacled Busdriver explained to me later, this motley crew made perfect sense: Underground rap is about acceptance. In grade school, he formed a group called 4/29, named for the start date of the 1992 L.A. riots. "We were two black kids and a Korean kid," said Busdriver, who is now 28. "We thought we were so positive, bridging the gap." But ultimately, he said, underground rap is just another avenue in the sprawling grid that is hip-hop. 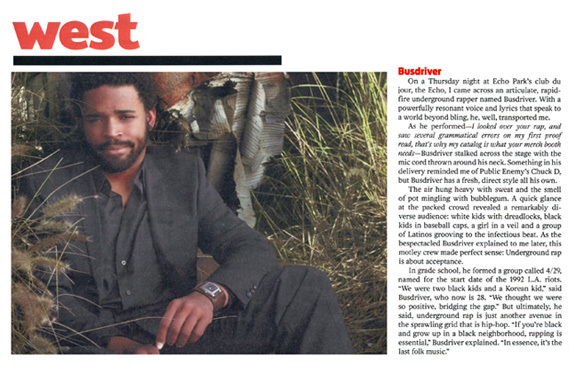 "If you're black and grow up in a black neighborhood, rapping is essential," Busdriver explained. "In essence, it's the last folk music."